If you’re considering getting a bassinet for your newborn and don’t know which one to pick, our list will help you make the right choice. There are several reasons why you might need a bassinet instead of a crib or in addition to a crib. It has some advantages too. Bassinets take less space and you can move them from one room to another, which is great if you want to keep your baby close to you. Your infant will be sleeping most of the time so it’s important to keep in mind his safety wherever you decide to place them. Here are some safe sleeping tips for parents to minimize risks. When on the road with your little one, they would also need a safe space to sleep on. This guide on the best 3 in 1 car seat will help you choose one that will grow with your child. So how do you know which bassinet to pick for your child? 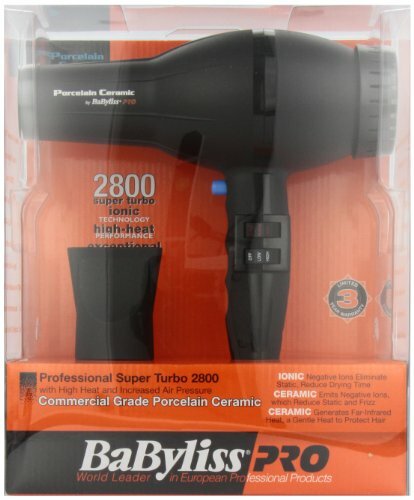 This list is made up of the best products with diverse features and designs. 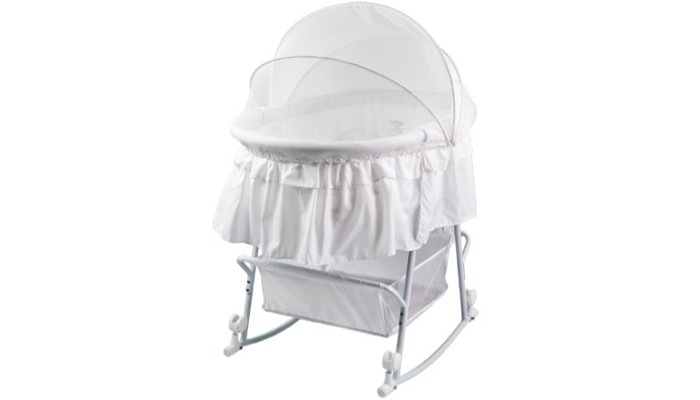 Our number one choice is the Delta Children Sweet Beginnings Bassinet. This will provide your baby with a comfortable sleeping area with a fitted sheet. 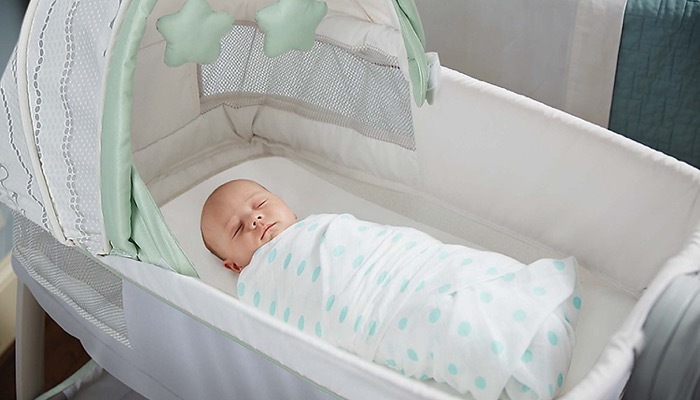 It includes an adjustable and removable canopy which you can pull down when he’s sleeping and easily pull up when you want to carry your baby. The calming nightlight and soothing music will help him get a good rest. It also has a large two-section storage basket. 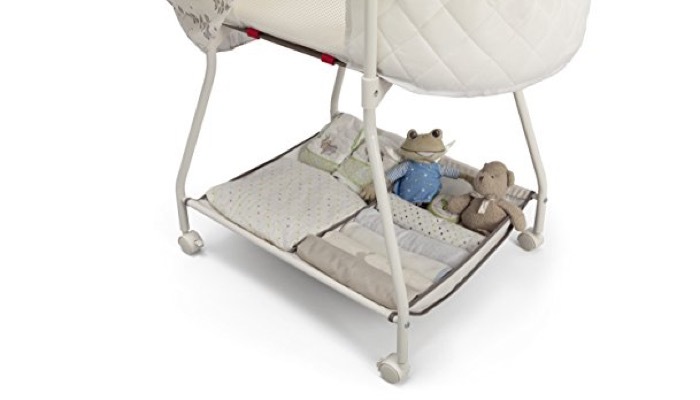 This bassinet is designed for infants from birth up to 15 pounds. The frame is lightweight so it’s easy to move around. It ha locking casters for extra safety and room to room mobility. 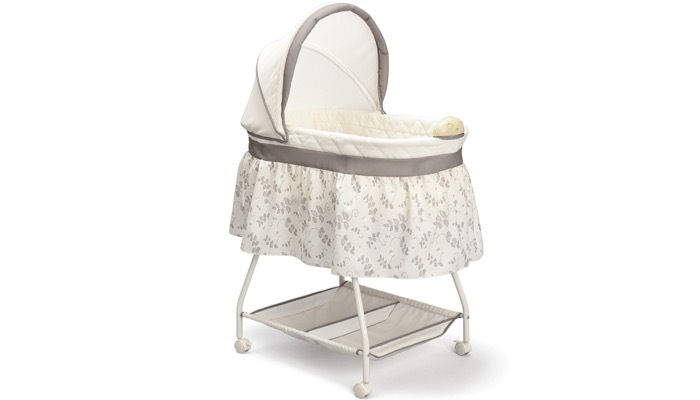 Our next top choice is the Dream on Me Karley Bassinet. This is great for newborns up to 25 pounds. 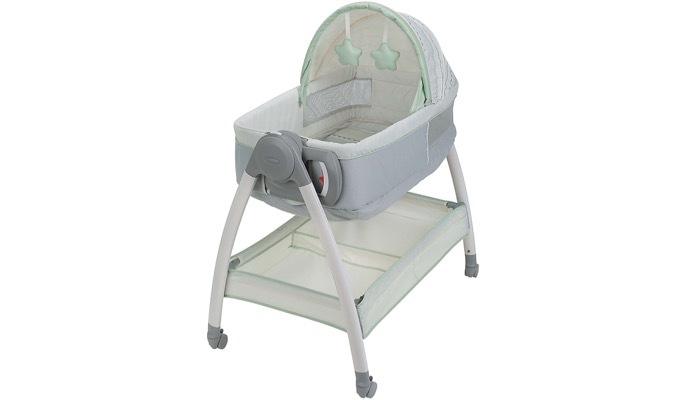 It’s a nicely designed bassinet in warm pastel colors. It also has a full canopy which you can pull up and down and covers the entire area to keep your baby safe while inside. 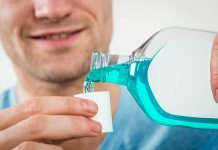 One disadvantage is that id doesn’t have wheels so you can’t easily pull it around from one spot to another in the house. It’s lightweight so even without wheels, you can still carry it around. This is made from polyester foam fabric and requires little assembly. If you want something that’s really versatile and mobile, the HALO Bassinet Swivel Sleeper is a great choice. 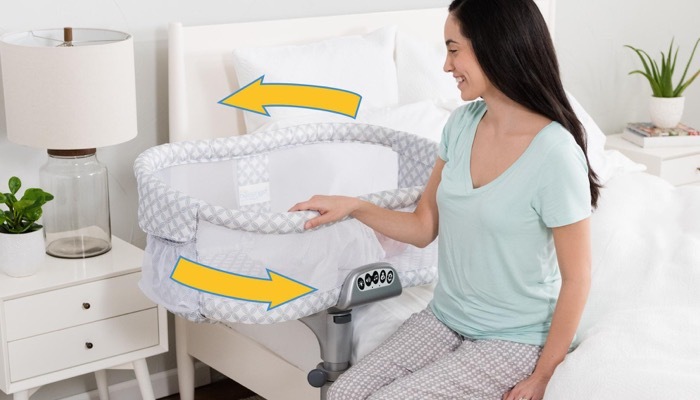 It swivels and rotates up to 360 degrees so you can pull your baby close to you and near your bed. The side lowers down so you can tend to your baby from your bed without getting up. It includes a nightlight, 3 lullabies, nature and womb sounds, and even vibrates to help your baby sleep. 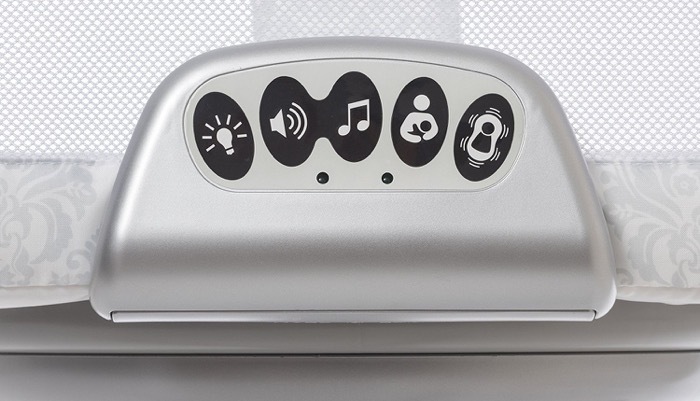 This is designed so that your baby is visible at eye level when you’re lying on your bed. The mesh walls provide breathability. You can adjust the base to fit the size of your bed. 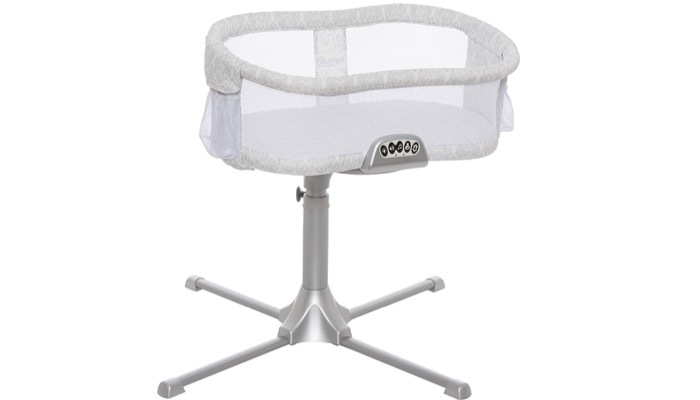 The Dream On Me Lacy Portable 2 in 1 Bassinet and Cradle is also a good choice. The great thing about this is that it transforms into a rocking cradle when you rotate the wheels in an upright position. Put your baby to sleep while gently rocking the bassinet. It has a full canopy which you can use as a mosquito net. It includes a sizable basket below where you can place your baby’s essentials. The hooded locking wheels allow you to pull and move it from one room to another. It includes a thinly covered mattress but you might need to purchase a thicker one if that’s not enough. You might also like the Graco Dream Suite Bassinet. This is a little bit more expensive but has extra functionalities. The great thing is that the bassinet is reversible so that it transforms into a changer. It allows for more diaper changes and can carry up to 30 pounds. This vibrates with two-speed settings to help soothe your baby. It has four locking wheels so you can easily maneuver it around. The canopy offers shade from bright lights. It also has two hanging soft toys that your baby can look at and play with. 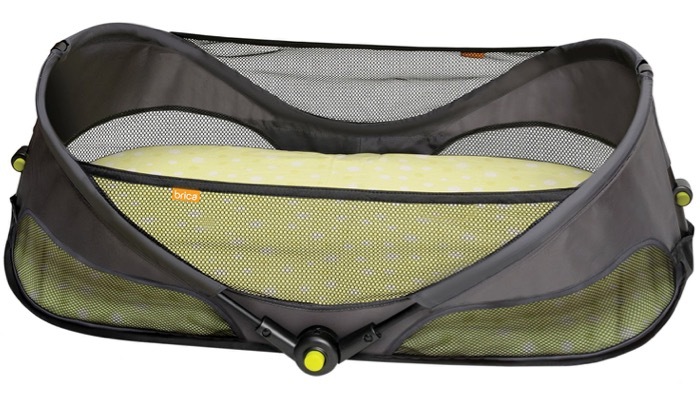 For those who travel a lot with their child and want something they can easily bring, the BRICA Fold N’ Go Travel Bassinet is perfect and affordable. This one does not have a stand but can be placed on beds or carpets. It’s lightweight and can be set up and folded down in seconds. 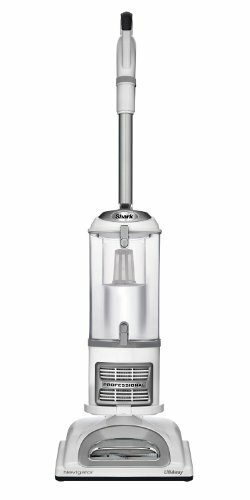 It includes a carrying handle so you can easily bring it around. The locking frame and durable sidewalls provide stability. It has a breathable fabric with ventilated mesh panels so your baby won’t be too warm. It also has a comfortable water-resistant mattress pad with a fitted sheet. Bassinets are great when you want to sleep with your baby in your room or if you have a limited space in your house. It will also help you keep a close watch of your child since they’re easy to move around. Number one thing to check is the safety. Unlike cribs, bassinets move around so make sure that the construction is not fragile. Check for the frames and the locks on the wheels. It should be stable and durable. Make sure that the materials don’t have emissions. The mattress should be firm but comfortable. It can’t be too thin or it would hurt your baby’s back. Most bassinets are designed with wheels so you can move them around from one room to another. This is great so you can keep a close watch on your child no matter where you go in the house. It would also be nice if the bassinet rotates so you can place it close to your bed. It would be nice if the bassinet includes a basket underneath so you can keep some important items handy. You might also like the ones that come with some sound effects or soothing music. Some bassinets also vibrate to help put your child to sleep. Others also have soothing nightlights. 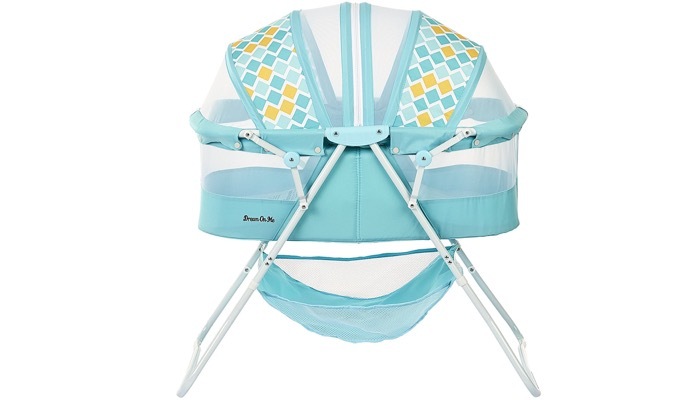 Other bassinets can transform into a cradle so you can gently rock your baby to sleep. 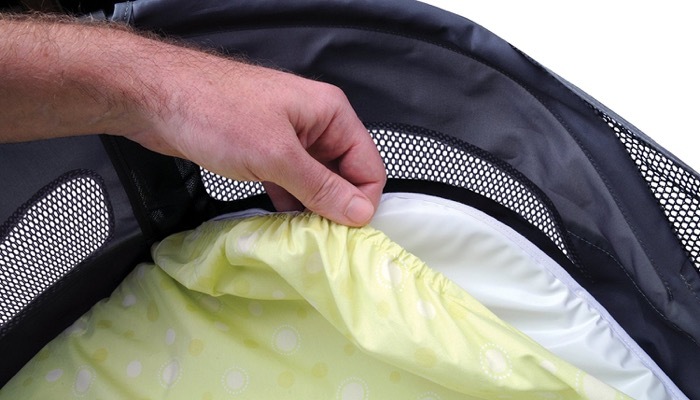 Other useful things to look at would be the canopy which can protect your baby from bright lights while sleeping. If you travel a lot, it would be good to choose one that’s portable and easy to fold down with a carry handle.